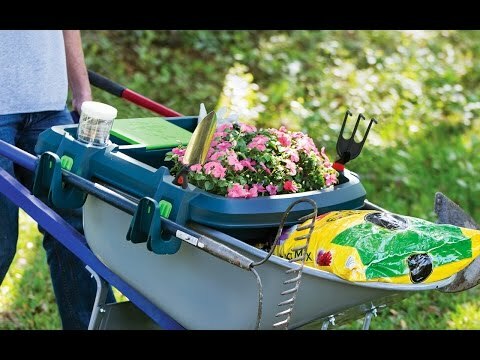 Clip this wheelbarrow organizer on and carry all your essentials in a single trip. Little Burros makes yard work easier to plan and execute. 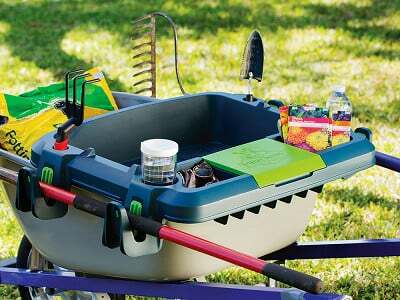 It sits atop your barrow, providing slots for everything you’ll need to garden, clean up, and spend the day outside. It fits gloves, tools, seeds . . . and even has a designated spot for a five gallon bucket. And to keep you connected while hard at work, there’s a roofed compartment for your phone. After Maker Bob Thompson spent the day going back and forth from the garden to the shed, he came up with the first prototype. 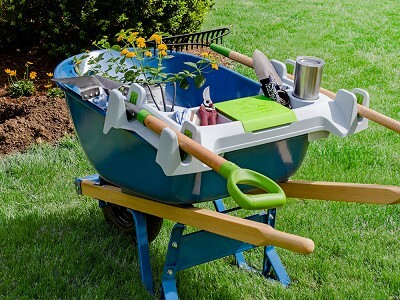 It’s not supposed to replace your wheelbarrow, but enhance and multiply its functionality—stealing only two inches from the standard storage space and adding compartments where they didn’t exist. This all-terrain addition is made from a UV-resistant material that won’t fade in the sun and grips firmly so it stays attached as you tilt and turn. Clip and equip to see what an organized wheelbarrow looks like. Mollie Thorsen here with The Little Burros! We are thrilled to be a part of The Grommet today! The Little Burros is an all-American, family-owned company that is dedicated to giving you quality, innovative products. 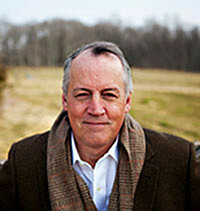 I am standing by to answer all your questions and comments, please feel free to send them on over. Welcome to the future of gardening! I have a Smart Cart that I bought after seeing it on Grommet. Will the Little Burro fit on that? From way back in the day, Martha. That's awesome. Unfortunately, Smart Cart and Little Burros have revolutionized the wheelbarrow in two completely different, innovative ways that are not compatible. @Martha Hi Martha! Thanks for the question! The dimensions of The Little Burro are as follows: 23.5" L x 35.5" W x 5.5" H! I am unfamiliar with the dimensions of the Smart Cart but I can tell you that we fit 97% of wheel barrows on the market, so if your cart is roughly the same width of a wheel barrow it could fit! 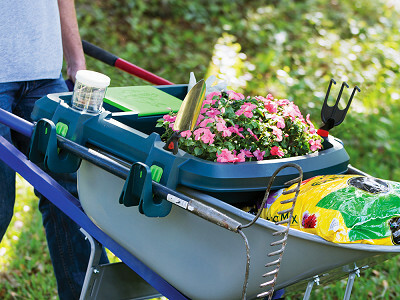 Even without the cart the Little Burro can be used as a gardening tray by itself, keeping everything in one place! Can you tell me th width of little burro I don't have a wheel barrel but a gorilla cart and wondering if it would work on that it would be great for the cart. @Margaret Hi Peggy! The dimensions are as follows: 23.5" L x 35.5" W x 5.5" H! I am unfamiliar with the dimensions of the Gorilla Cart! We always suggest using either a 4,5, or 6 cubic foot wheel barrow but depending on the width of the cart it may be compatible! 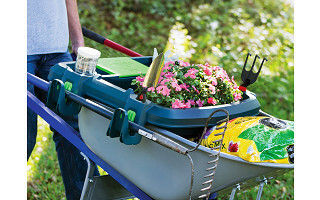 Either way The Little Burro is a great way to keep your gardening organized, and it's proudly made in the USA! This is genius! I have a big yard with hills - this idea of reducing the number of trips to get all the tools & supplies I need is FANTASTIC! Thank you! @Nichole Thank you Nichole! We love it and we love seeing other peoples enthusiasm! Thanks for the compliments it means the world to us, hope you find the Little Burro just as handy as we do! What are the dimensions...I normally don't use a wheelbarrow. I use a pull cart for my gardening and I have 2 different sizes. This would be very helpful. @Betty thanks for asking! The dimensions are as follows: 23.5" L x 35.5" W x 5.5" H! We love using our Little Burro with most standard 4,5, and 6 cubic foot wheel barrows, but if the width of The Little Burro is compatible with your cart then please let us know! Hope this can help answer your question!